When both the CEO and the board look at the world through Teal lenses and are personally excited about it, get started. Most importantly, sense with your collegues what the organization calls for. Is the purpose unclear and do people lack the energy to work on company goals? Does the hiearchy need to be broken down? Or is there a need to build trust and community? There is no blueprint needed, no silver bullet or perfect solution to be found. Discover the next, workable step. “If your CEO and Board don’t get it (yet), you can still explore and implement Teal practices, be it on a team or department level. Take into account the existing framework of rules and processes within your organization, and go for new ways of working in the area where you’re responsible”. When you have a map of current practices, these observations can be linked to the developmental stages of organizations described by Frederic Laloux. Reflect on each practice and become aware from which predominant frame of reference your organization operates. Is it Amber, Orange or Green? Followed by the question: “What would this practice look like from a Teal perspective”? For example, training from an Orange perspective often refers to fixed trajectories designed by HR with a focus on development of skills. 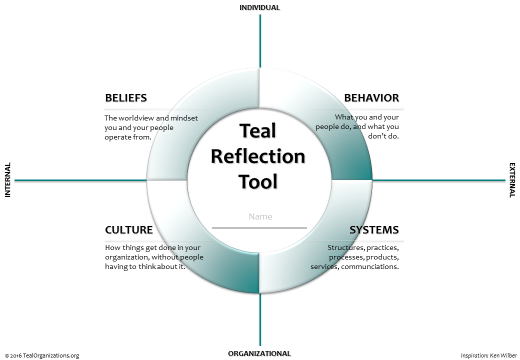 Training from a Teal lense could be that people have personal freedom and responsibility for developing their own training program. The book Reinventing Organizations has an extensive list of Teal structures, practices and processes in appendix 4.